This delicious mousse from Rougie is made of duck foie gras, duck fat with Armagnac and Port and 2% truffle. To serve this mousse, warm-up the blade of knife with hot water. 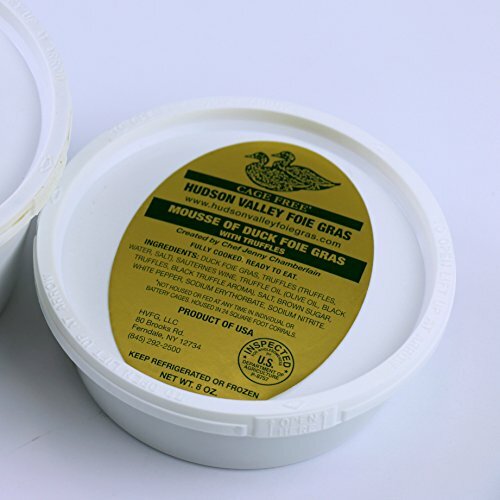 Cut the foie gras into 1/3-inch slices. Add fleur de sel and ground pepper to taste or even a confit of onions, fig jam or balsamic glaze. Serve chilled but not ice cold. Serve with French bread or brioche, but do not spread or mash on the bread to fully enjoy the rich texture and taste. Serve with late harvest ice wine, port, or sauternes. Ideal for a party of 6 to 8. Refrigerate after opening.Product of Canada. Light and delicate emulsion with 20% duck foie gras in Tin. Fully cooked / Sterilized, Prepared / Ready-to-eat. Refrigerate before opening can. Serve chilled but not ice cold. Cut-out 1/3 inch slices to display on center of plate or use as spread. Serve with or on French bread or brioche. May also be used for stuffing or as a steak topping "Tournedos Rossini" -style. Ideal for a party of 10. 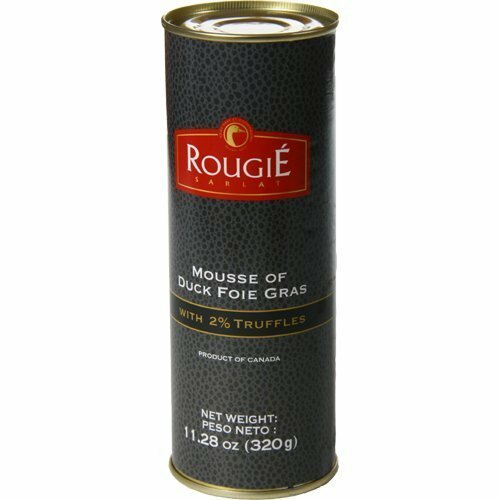 Duck foie gras with truffles by Rougie, 3.17oz. 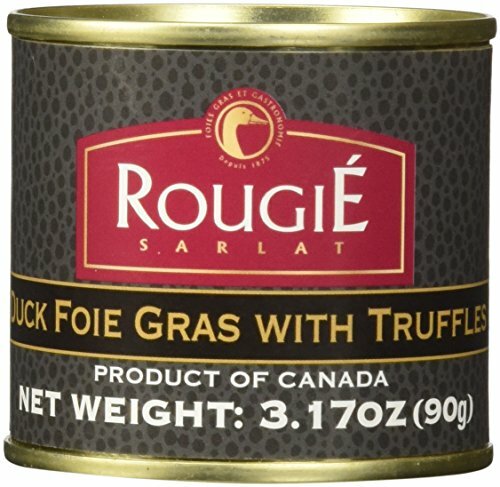 Description: duck foie gras with truffles by Rougie, shelf-stable, 3.17oz./90gr. This recipe with duck foie gras is a great ready-to-serve preparation. In a small format, plain or without truffles, this product is ideal for serving on toasts or as a center-of-the-plate appetizer. Ingredients: duck foie gras, water, truffles, Armagnac (Armagnac, salt, pepper), salt, sugar, sodium erythorbate, white pepper, sodium nitrite and gelatin. Allergens: free. 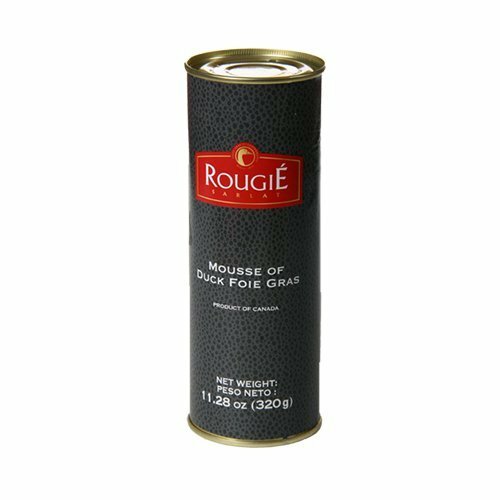 Serving Rougie foie gras: refrigerate before serving. Open both ends with a can opener and push on one end to remove content from tin. Cut into ¼inch slices and serve cold. Made by the leading French producer of Foie Gras, this sumptuously rich and fully cooked duck liver with 2% truffles is whipped into a lighter and more spreadable consistency. Serve chilled and enjoy on toasts, baguette or brioche. Serves up to 10 persons. Comes in a round tin. Pork-Free. This new recipe with parfait of duck foie gras with truffles is a great ready-to-serve preparation. 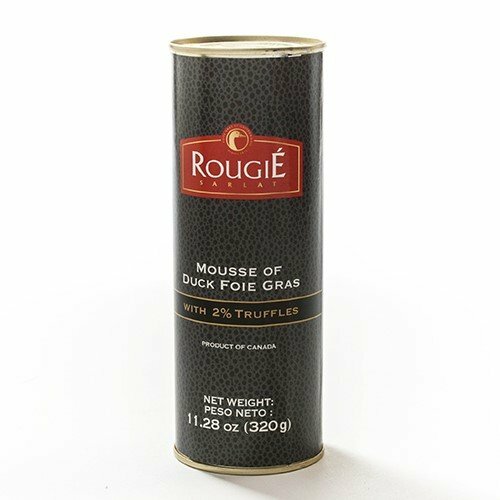 In a small format, our duck foie gras terrine is ideal for serving on toasts or as a center-of-the-plate appetizer. 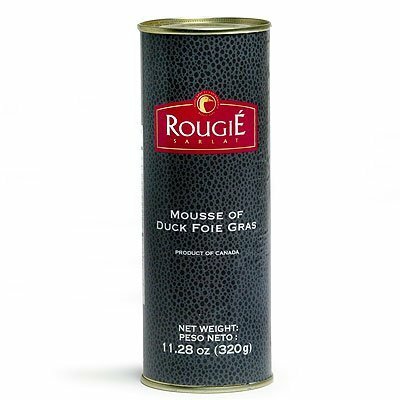 Hudson Valley Foie Gras 'Farm to Table' Mousse of Duck Foie Gras with Truffles, 8 oz. How can you make foie gras even more delicious, you ask? Add black truffles, we say! Velvety texture, luxurious flavor. Perfect on toast for hors d'oeuvres. Product is fully cooked, Ready to eat. Keeps 4 weeks in packaging. This light and tasty Foie gras mousse - intermediate between pate and foie gras - is made with duck foie gras. This foie gras mousse also contains 2% truffles, which makes its taste unique and particularly refined. This generous-sized tin is perfect for parties. Like foie gras this mousse should be served chilled. 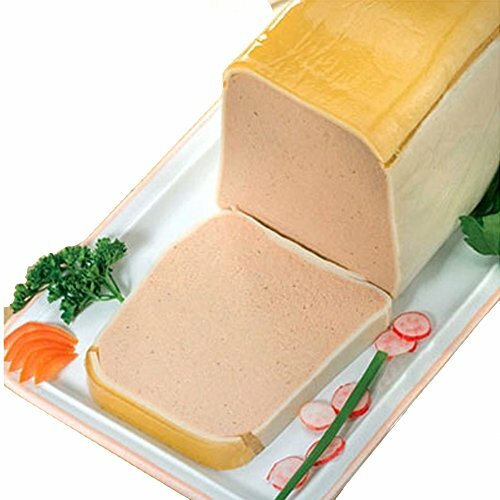 This gourmet duck foie gras mousse is imported from France. A silky mousse of duck Foie Gras, duck liver and raisins marinated in Port wine. It is perfectly cooked and seasoned, then topped with aspic. Pork-Free. Serve with a toasted brioche bread or crackers. Pork Free. Pairs well with a sweet wine such as Sauternes, Beaumes de Venise or Montbazillac. Comes in a 3.5Lbs loaf. Many of Fabrique Delices products have been served at the White House. 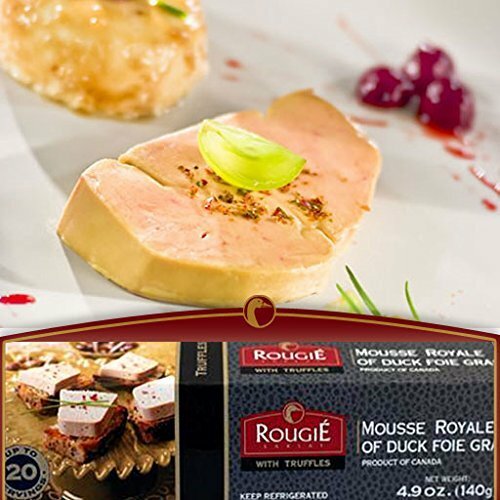 Compare prices on Duck Foie Gras Mousse at ShopPlanetUp.com – use promo codes and coupons for best offers and deals. We work hard to get you amazing deals and collect all available offers online and represent it in one place for the customers. Now our visitors can leverage benefits of big brands and heavy discounts available for that day and for famous brands.